Some 2500 years ago, as legend goes, a pair of master swordsmiths (and lovers) Gan Jiang and Mo Ye , travelled to Moganshan mountain to complete an important commission - a sword for the King of Wu, a sword to surpass any sword previously made. The couple knew that the making of such a powerful sword would necessitate their deaths at its completion to prevent the King's enemies from commissioning an equal. The lovers managed to delay the sword's completion by three years, during which time their son Mo Gan was born. Gan Jiang finally took this extraordinary sword to the King and was immediately beheaded. Unbeknown to the King, however, Gan Jiang and Mo Ye had actually fashioned not one, but a pair of swords, Yin and Yang. The feminine yin essence of the swords had come from Mo Ye's flowing black hair, which she cut off and cast into the furnace. Gan Jiang gave the first sword (Yin) to the King, but the second sword (Yang) he had kept for his wife. Years later his son, now a young man, used the sword to kill the King and avenge his father's death, but was himself killed in the process. 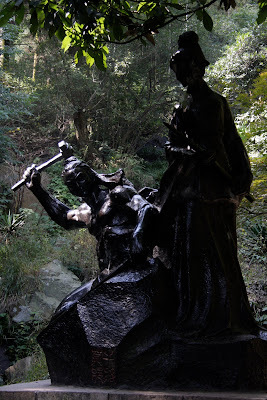 A little walk down the valley from Moganshan village is a beautiful bronze statue of Mo Ye and Gan Jiang, overlooking the Sword Casting Pool.